Redlands, California—Esri, the global leader in spatial analytics, today published The GIS 20: Essential Skills, Third Edition, a book designed to quickly prepare those who need to use a geographic information system (GIS). The GIS 20 is aimed at readers who are new to or unfamiliar with GIS, such as a professional interested in using the technology on the job to conduct analysis and create maps, or a student majoring in a subject other than GIS who could benefit from geospatial knowledge. Avoiding a focus on the inner workings of a GIS and sticking instead to teaching the tasks and functions most frequently and commonly used,this quick-start guide provides clear, step-by-step instructions on how to do common GIS tasks. These include downloading shapefiles and using essential tools in the software, preparing data for a map, geocoding addresses, making thematic and other types of maps, mapping latitude and longitude points collected with a GPS, using aerial photography in maps, and publishing maps. Author Gina Clemmer is president of New Urban Research, Inc., a social research and training company based in Portland, Oregon. She has spent her career teaching everyone from executives in New York City to residents of fishing villages in Alaska to how understand the core concepts and use the tools of GIS for decision-making. "This book is an extension of my passion to help everyday people quickly learn the fundamentals of ArcGIS," Clemmer wrote in The GIS 20. "Once you see the power of GIS and see that you yourself can create maps easily, you simply can’t unsee it. GIS will change the way you think about presenting data and solving problems." 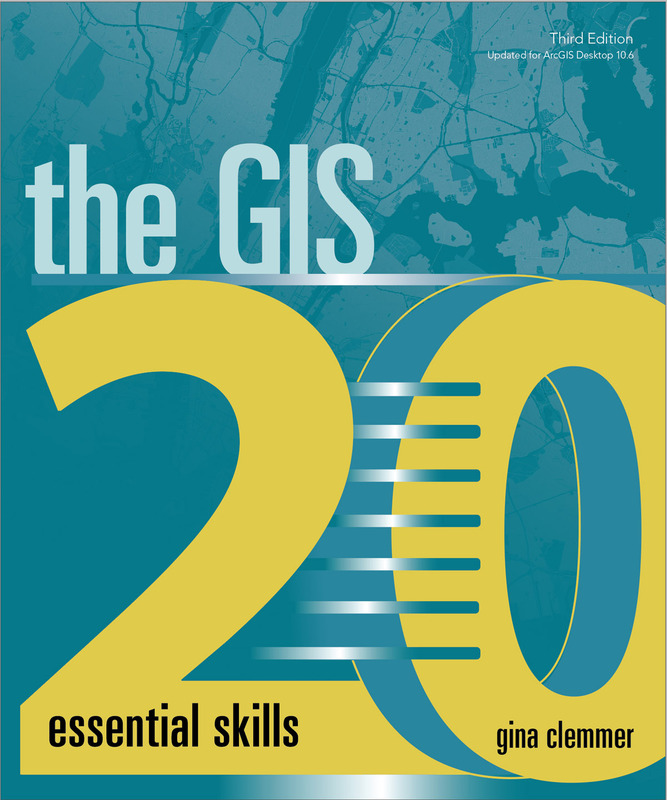 The GIS 20: Essential Skills is available in print (ISBN: 9781589485129, 180 pages, US$49.99) and as an e-book (ISBN: 9781589485136, 180 pages, US$49.99). The print and e-book editions of the book can be obtained from online retailers worldwide, at esri.com/esripress, or by calling 1-800-447-9778. Outside the United States, visit esri.com/esripressorders for complete ordering options, or visit esri.com/distributors to contact your local Esri distributor. Interested retailers can contact Esri Press book distributor Ingram Publisher Services.